Who actually uses payday loans in America? Pew found that more than 5 percent of adults in America have stated they got a payday loan in the last 5 years. More people went to stores than applying for a loan online, about 3 to 1. More than 10 million people get a payday loan each year. On average, a person gets 8 loans of around $350 each year and incurs over $500 in interest expense. More payday loan applicants are women between the ages of 25 and 45. The surveys showed that there are certain categories of borrowers that are more common. These include people who do not have a college degree; renters; African Americans; people earning less than $40,000 per year; and those who are living as a single parent or alone. However, not everything applies equally, as, for example, renters with higher income got more payday loans than lower income homeowners. Why do people use payday loans in America? Most people use payday loans for what are called ‘everyday living’ expenses and not financial emergencies. The average person who gets a payday loan is in debt for around 5 months a year. Payday loans are best used as short-term loans for unexpected or emergency expenses, like a necessary auto repair or medical expense. Too often people use payday loans as a regular way to handle expenses rather than following a budget. This is what gets people into trouble. More people get a payday loan for expenses like utilities, credit card bills, rent, or mortgage payments. Although these are not often considered emergencies, they can be. For example, missing a utility payment can result in very high penalties, additional deposits required, and reactivation fees. 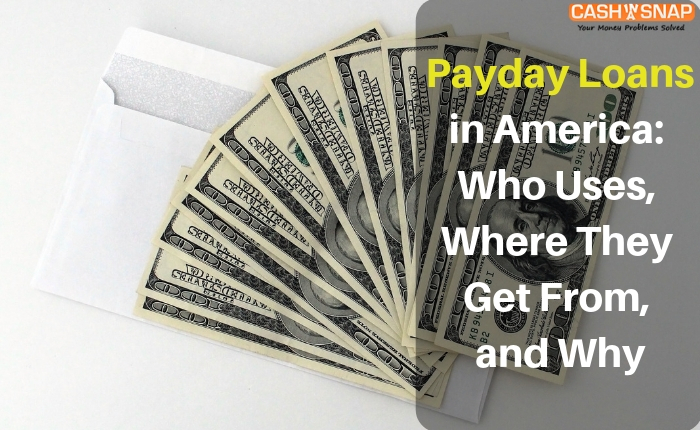 These fees can outweigh the high cost of the payday loan. So can a slew of NSF charges from the bank for overdrafts… $35 a check is common, but 4 bounced checks can cost $140 – more than the payday loan fee. What would people do without payday loans? Unfortunately, many people surveyed said if they didn’t have payday loans available, they would cut back on essentials like food or clothing or paying bills or even sell things they owned. Part of this is because the majority of people getting payday loans don’t have other credit options like a credit card or ability to get a bank loan. Payday loans aren’t for everyone. They really should only be used for emergency expenses when all other options have been explored or when the fees from a utility stoppage or late bank fee charges are more than the fee for the loan. If someone has an emergency need, they should consider online payday loans as they are fast, secure, and provide better odds of approval in general.